His comments came on Tuesday, September 16 when the First Caribbean International Bank (FCIB) made yet another donation to the Milton Cato Memorial Hospital (MCMH). This donation came in the form of medical equipment valued at EC$25,000. It was handed over to the Ministry of Health, Wellness and the Environment during a short ceremony, which was held at the Nursesâ Hostel in Stoney Ground on Tuesday. âThis helps us with the modernization of the health sector and helps us meet the needs of the sick and vulnerable in society,â said Burgin. âWe really do appreciate the effort during this time. Your contribution has gone a long way in ensuring the system functions properly,â said Burgin who revealed that FCIB has not only given the Ministry equipment, but they have also helped with refurbishing a part of the hostel that is used to store medical supplies. âWe are very appreciative. This shows that you, as a corporate citizen, recognize that health is an expensive venture and you want to help us bear some of the cost, especially in this financial climate,â said Burgin. Branch Retail and Banking Operations manager at FCIB Andre Cadogan said that the EC$25,000 donation was made available through FCIBâs Comtrust Foundation. He said that this foundation allocates funds to various important, emergency or worthy causes. âThis is a foundation that is part of FCIB and we recognize that the disaster (December 2013 floods) was impactful and we want to play our part,â said Cadogan, who added that they have also made an EC$100,000 contribution to the Ministryâs disaster relief effort. âWe see our role as very important to not only the corporate community but the general community and we pledge our support in the future,â said Cadogan. He added that it is very expensive to manage health care delivery, âand we are grateful of the part that the corporate sector is playing. It is amazing what we have got by way of assistance and support and we have a huge need for these things,â said deShong. Deputy hospital administrator Donna Bascombe said that FCIB donations will touch several different aspects of health, not just maternal and child health. âThere is equipment for the operating theatre and items to boost our emergency response. The service that we give will be greatly enhanced by this equipment,â said Bascombe. 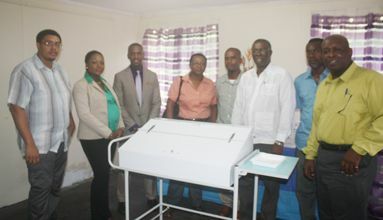 The donation was also witnessed by accountant at the Milton Cato Memorial Hospital Andrew Williams, senior clerk and Stores manager Johnson Pope, administrative officer, Heath Planning Unit, Roxanne Williams, Health Disaster Management specialist Deroy Ferdinand and Business Support officer at FCIB Jacintha Hinds. Donated on Tuesday were a fetal monitor, a diathermy machine, a manual suction unit, a Fermatrac traction splint (adult) and a medication cart.